Cooking Simplified is Fun @ GayatriVantillu! 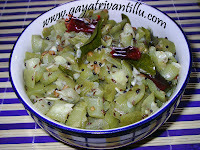 Take 2 liters of milk and curdle to make Chenna (Click here to see). Take a slotted plate and spread a muslin cloth in it. Pour this Chenna along with the water into this slotted plated. After all the water got drained, bring the muslin cloth together and press to remove excess water from Chenna. To test whether all the water got drained from the Chenna, take a little Chenna in your palm and rub with your finger until it is smooth. Then try to make a ball from the rubbed Chenna. If you get a firm ball then it is ready to make Malai Chops. If the ball is too smooth and falls flat then it means that there is still some more water present in the Chenna which is to be removed. There is another method to remove water. Place the Chenna, which is taken in the muslin cloth, on a slotted plate and put some heavy thing above this which will press the Chenna below and excess water will be removed. Here I kept the Chenna under heavy weight for one hour. When all the water is drained we get a flat, dry Chenna mixture which we call it as Paneer. 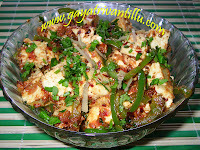 With this Paneer also we can make Malai Chops. Remember, the Chenna or Paneer should be at room temperature only. Take the Chenna on to clean platform and start rubbing it with your palm. Bring the Chenna together and rub once again. Like this you rub the Chenna till it is smooth. We should feel the ghee on our palm. We should get smooth dough to get soft Malai Chops. It takes just few minutes to rub. We can do the rubbing part in a processor also. Take a processor bowl and arrange the flour kneading blade to it. Scramble the Paneer with fingers and add it to the bowl. Now close the lid and run the processor on low speed. First you will see that the Paneer is dry. After sometime you get soft dough from the scrambled Paneer. Then stop the processor and check. Take a pressure cooker and add some water. Now put this pressure cooker on heat. Take sugar and water in a flat dish and heat it. Stir the sugar mixture till all the sugar is melted. Now allow this syrup to boil. Make equal portions of the soft Paneer dough and make them into rectangular slabs. When the sugar syrup is boiling add the rectangular Paneer slabs to it. Now keep this bowl in the pressure cooker and close the lid. When the cooker is about to whistle, slow the flame and cook for 15 minutes. When the cooker is completely cooled off then remove the pan from it. You will see that Malai Chops are double in size. Keep them aside for at least 4 hours so that they become firm by absorbing more syrup. Take milk in a non stick pan and heat it. Boil the milk till it is reduced stirring with a spoon. When the milk is thick add sugar and mix. When sugar is added the milk mixture will become thin. So reduce further by evaporating the milk to get Malai or Khoa. Take scrambled Paneer in a mixie jar. Add the prepared Malai to the mixie jar and run the mixie to get a smooth paste. Take this paste into a bowl and keep it aside. When cold take out the cooked rectangular Paneer slabs from the syrup. Cut them horizontally to get 2 pieces. Apply the prepared Malai on each piece and keep them aside separately. While serving, make sandwich of two malai chops as shown in the movie. This sweet dish is a delicacy in Orissa. Serve to your family members and guests this tasty sweet.